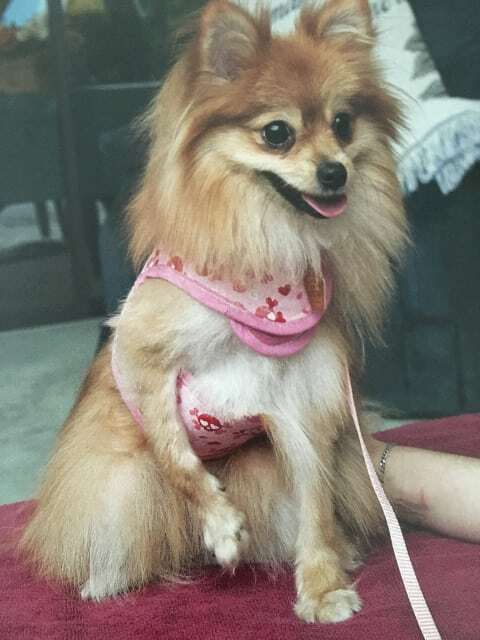 My name is Karen A. Breitwieser, DVM and I am privileged to be the mommy of Peaches, a Tripawd Pomeranian. (Her Twitter handle is @peachespompom1 ). Her story is a little different than some, and while she is small, she is fierce! She’s nearly ten years old, and has been a right forelimb amputee for nearly 9 years. For the past two years she has received monthly chiropractic adjustment and since her shoulder injury in December monthly acupuncture as well. I am fortunate that there is a nearby facility with hyperbaric oxygen therapy which really helped her through the acute part of the injury. 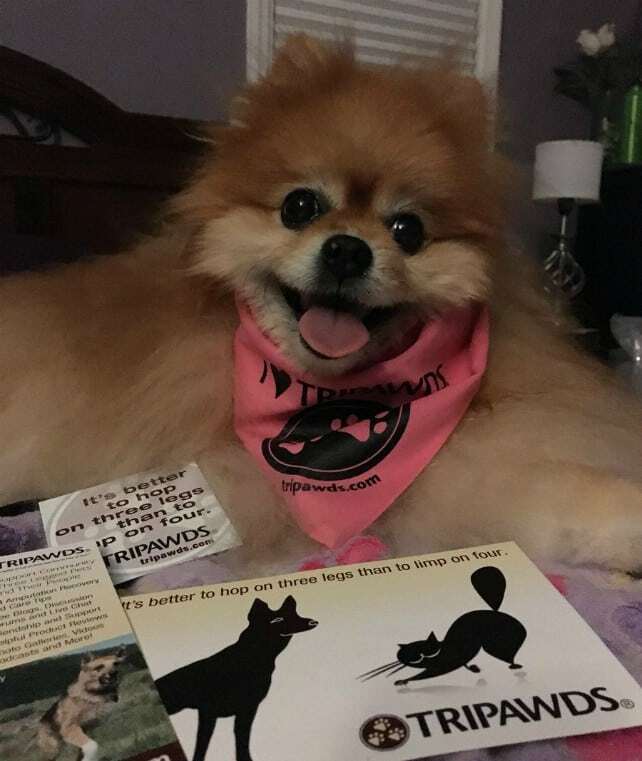 Peaches shows Tripawds can be tiny but mighty! Peaches was meant for someone else. I had adopted this 1 yr old Pomeranian for a client who had lost their Pom. Peaches had been left at a shelter with a broken right foreleg. The shelter performed the wrong surgery, not the surgery they had said. Peaches wasn’t healed. She had a pin stuck into her carpal (wrist) joint to try and stabilize the fracture. I removed the pin under sedation and her leg bent. It bent above the joint, where it shouldn’t. On went a hot pink cast. A pink dress was all it took to help her blossom into a social butterfly. I had a board certified Veterinary surgeon explore her fracture site. Unfortunately, her radius was green and grey: dead bone. There was no choice. That September day, in 2009, Peaches became “left handed”, aka a right forelimb amputee. My clients didn’t want her anymore, not with three legs. With my long work days, keeping her didn’t seem feasible, but adopting her out turned out to be nearly impossible. Too fuzzy, too underfoot, too barky, so on and so forth. So gradually, Peaches became my hostess at the animal hospital. And I became a mommy. She has more outfits than her human mom! People often wonder why Peaches is so well dressed. While recovering from her amputation, the surgeon covered her up with an ugly large stockingette, a type of bandage. She would hide in the back of the hospital. I put a nice soft pink dress on her to cover her sutures and suddenly she was a social butterfly. Greeting clients and patients. She’d give the Sheriff’s dogs a piece of her mind: barky bark, then lick a cat’s ears. She started escorting clients and pets into the exam room. My canine patients seemed, and still seem today, to be much more relaxed seeing this little dog in a dress prancing around, then snoozing in a bed during their exam. Peaches is now working part-time at the animal hospital due to a recent shoulder injury. She is turning 10 soon and will likely retire and become the full time pampered grandpup. She is the love of my life; I cannot imagine my life without her now. She completes me. Can you tell I dote on her?